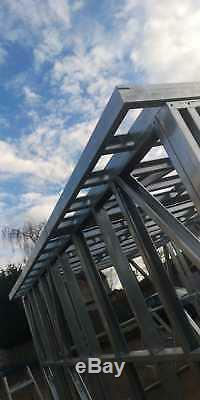 This kit is made in sections allowing you to erect on site in under 30 minutes, slashing your time and labour costs. 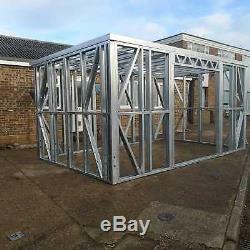 If that wasn't enough, this frame is made out of galvanised steel, and in 100mm box section. Meaning no rot problems in the future. This CAD designed building measures 5m x 3m with the opening for a set of bi-fold or french doors. The perfect kit to start your Garden building project. The sections are screwed together, literally in minutes. This kit is probably the strongest, long lasting, quick to build you will find ANYWHERE. Our production facility allows us to build vast quantities of these if you are in the trade and looking for a fast turnaround for your projects, and out in house CAD designers can build you anything. 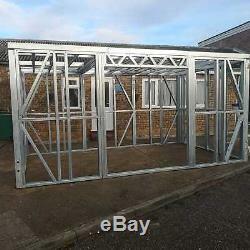 Ideal for Garden offices, summer houses, extra living space, bar, cinema, hot tub rooms, gym's etc. Collection is from Maldon in Essex or Alfreton Derbyshire. If you need any inspiration on how this building will look once built, just google garden rooms... The item "Garden Building Frame, metal frame, garden room, gym, home office, summer house" is in sale since Saturday, December 22, 2018. 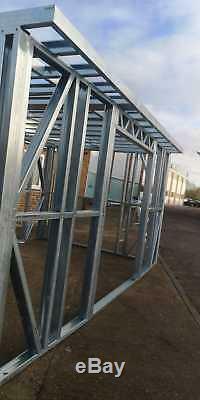 This item is in the category "Business, Office & Industrial\Containers & Pre-Fab Buildings\Pre-Fabricated Buildings". 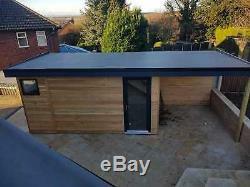 The seller is "rubberroof" and is located in Maldon Essex.